G. James Daichendt, a professor of art history at Azusa Pacific University in California, will present the lecture “Rethinking Street Art” on Tuesday, Jan. 31, at 6:30 p.m. in Shemin Auditorium in the Dorothea Ilgen Shaffer Art Building. The free, public lecture is sponsored by the art education program as part of the Department of Art’s Visiting Artist Lecture Series in the College of Visual and Performing Arts (VPA). Daichendt’s presentation will feature a discussion on the phenomenon of more than 50 legal murals along with dozens of gallery and museum shows, blogs and news sites that have taken the Los Angeles art scene by storm in the last two years. While institutionally the commitment to art education has been faltering, it is thriving outside the professionalized field. Based upon interviews with more than 40 members of this art-making community, Daichendt’s presentation will highlight what artists and educators can learn from this idealistic and counterintuitive movement. He will also discuss the nuances involved in working in the cross sections of art criticism, art history and art education. 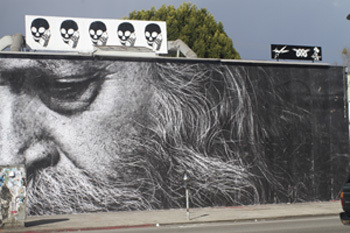 Daichendt is the author of the books “Artist-Teacher: A Philosophy for Creating and Teaching” (Intellect, 2010) and “Artist Scholar: Reflections on Writing and Research” (Intellect, 2011) and is currently working on a third book that focuses on street art in Los Angeles. He is the principal editor of the academic journal Visual Inquiry: Learning and Teaching Art and is the arts and culture editor for the magazine Beverly Hills Lifestyle. A regular contributor to a variety of arts journals, including Teaching Artist Journal, Art Education and the International Journal of Art & Design Education, Daichendt also contributes art criticism for Artillery: Killer Text on Art and ArtScene. He holds a doctorate from Columbia University and graduate degrees from Harvard and Boston universities. For more information about the lecture, contact James Haywood Rolling, dual associate professor of art education and teaching and leadership, at 315-443-2355 or jrolling@syr.edu.